Subtext has a ton of features designed to help you create the most meaningful story ever in the shortest amount of time. This Quickstart Guide will show you how to get up and running in the matter of a few hours. To get started with Subtext, you first must sign up for a subscription. Subtext is a service that is continually growing and developing--more stronger and more powerful than the day before yesterday--and a subscription ensures that this development continues. Once you set up your account with Subtext, you'll find two buttons at the top of the screen: one marked Stories and the other marked Explore. Explore is where you can search our catalog of over 420+ unique narrative structures and perhaps find one that you want to use for your own story. It's also where you can learn more detail about the Elements of Story Structure and learn how to apply what you learn in our weekly Writers Room meetings. 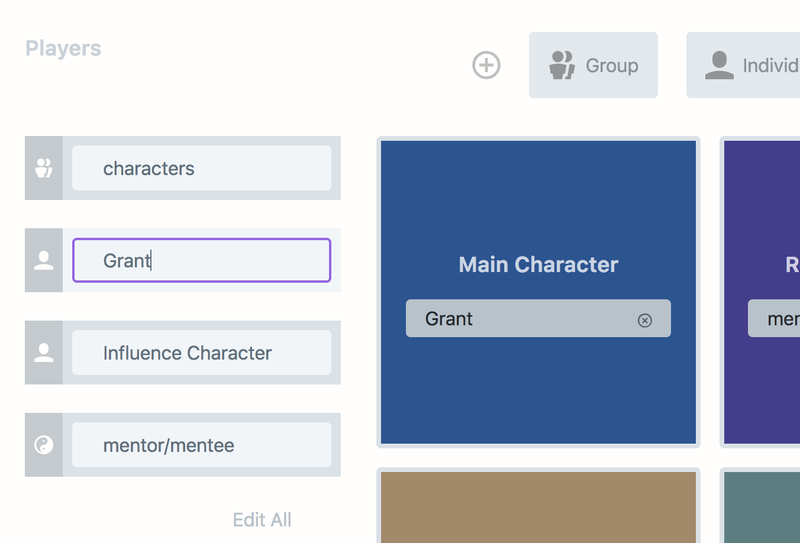 Stories is where you'll find your own creations--and where we will start for this guide. Tap Stories to be taken to your Story view. When you first open up Subtext, your collection of stories will be empty. Fear not, that space will soon be filled with amazing and compelling stories. Tap Add to create a new story. Once created, you can determine the Title of your story (even if it's a working title), and then tap Develop to get started. 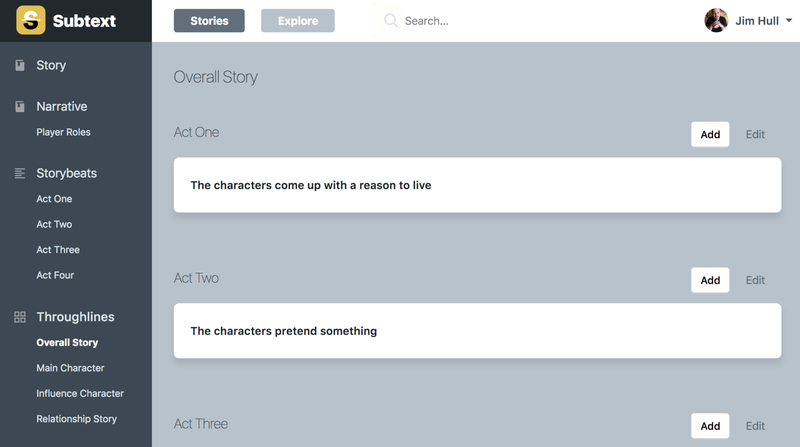 Subtext is the first software application for writers that allows for multiple narratives within a single story. What does this mean? Do you know why the Lord of the Rings trilogy required three movies to tell the entire story? Do you know why Game of Thrones required so many seasons? Because there wasn't just one story throughout for these productions, there were several stories. Technically, there were several narratives--which we'll explain in a moment--but this is the reason why those massive epics required so many minutes to say what they wanted to say. On average, a complete narrative can be told in a little under two hours; turns out this is about the minimal amount of time needed to cover all the bases when it comes to making a complete argument. Occasionally, the Author of a film might try to squeeze in an extra narrative--think of Finding Nemo where the additional narrative of Nemo in the aquarium sits separate from the main narrative of actually finding Nemo. Or think of Jerry Maguire where the Romance Story and the Sports Story balance each other out (and now you know why that film runs almost 2.5 hours -- it had two narratives!). Subtext offers writers the ability to capture as many narratives as they want within a single "story", or work. It's likely you're not sure exactly what you want to say yet; this is a "Getting Started" guide, and you're probably just interested in seeing how Subtext works. Because of this, we're going to grab a random Narrative Structure from Subtext and add it to our current story. For now, we're going to go with the Random option. Tap Random to be taken to your story's first random structure. Before Subtext attaches the narrative to your story, it checks to make sure this is the kind of story you want to tell. The box at the top is the most important. Read it carefully and make sure your writer's intuition agrees with what is being said. The Narrative Argument is the key to everything within Subtext. By confirming this choice, you're saying you want to build an entire story that makes this argument to your Audience. A Tragedy or Cautionary Tale is structured much differently than a Triumph--so choose wisely. Below the Narrative Argument you'll find a list of key story elements along with an assortment of narrative structures that somewhat approximate the same message. 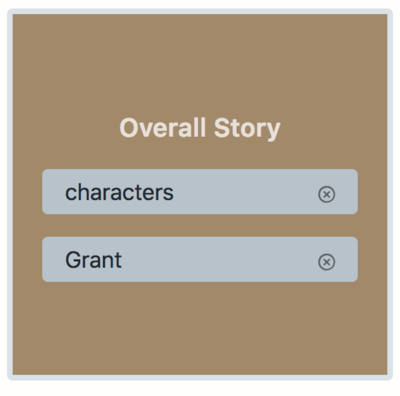 Assuming you still agree (and you do for this example), tap Add Structure at the bottom of the screen to add this narrative to our sample story. 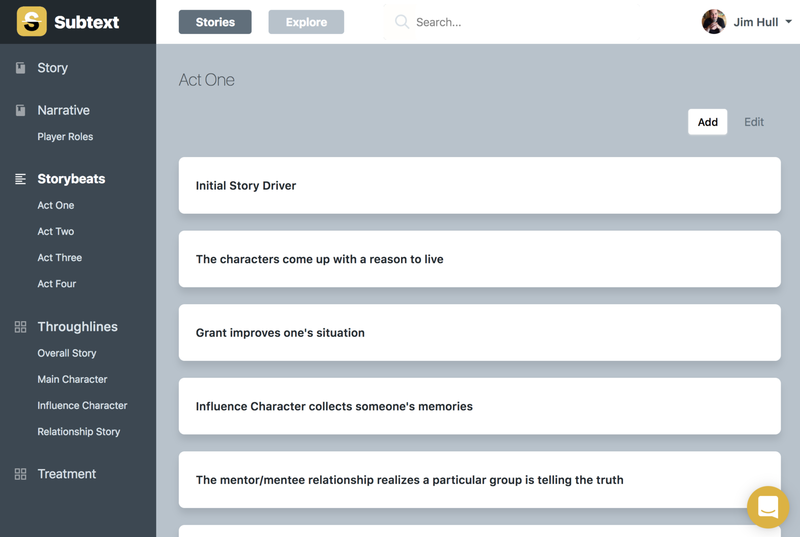 After a brief magical interlude, Subtext will return to the Structure Builder screen with a focus on the Narrative section. 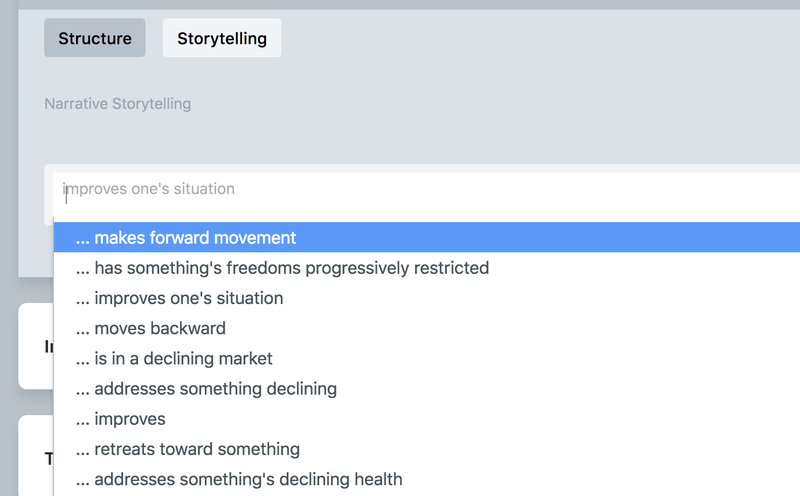 You'll now find a Narrative Structure card listed under Current Narrative. This card reminds you of the Narrative Argument you selected, and offers a place where you can change the Title of the Narrative if you want. For now, we're going to change it to "Our First Narrative". You'll also see an Advanced navigation tab--skip this for now. 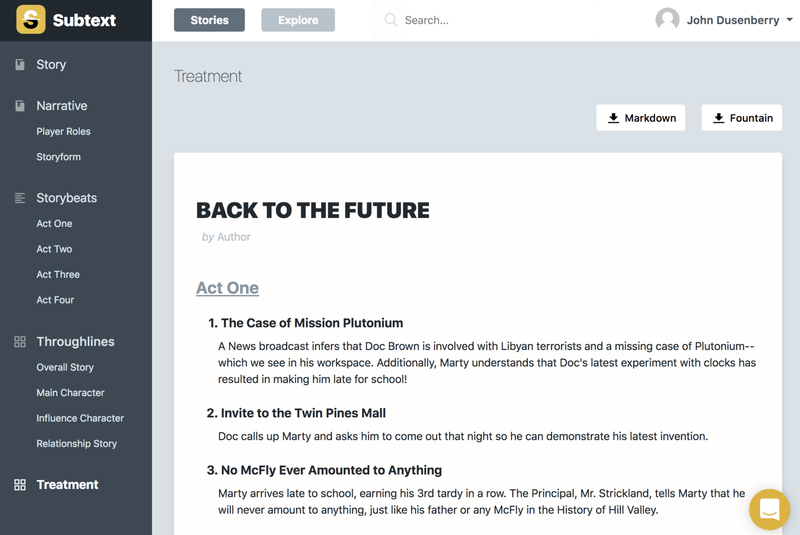 Subtext wants to make writing your next story easy. This means that, by default, it hides all the complicated aspects of narrative structure from you. Try to stay away from the Advanced features as long as possible when you're first starting out. 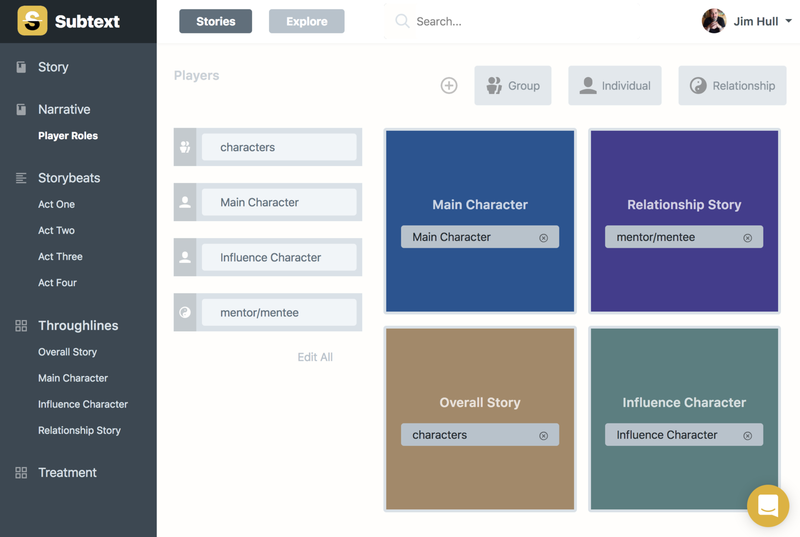 Tap the Player Roles button for this Narrative and you'll be presented with one of Subtext's most unique and powerful features: Assigning Player Roles. The Overall Story is what you think of when you think of story; it's also often referred to as the "A" plot line, or simply, the plot. The Influence Character and Relationship Story Throughlines, though, may seem foreign to you. Some paradigms of story erroneously blend these two Throughlines together into something called the "B" plot line--they're really two separate and essential parts of a complete story. The Influence Character Throughline is the point-of-view that challenges the Main Character to grow. The Relationship Story Throughline is the relationship between the Main Character and the Influence Character. On the left, you'll see a list of Players within your story. These Players hold the perspective of the different Throughlines. On the right, you'll see four boxes that represent the Four Throughlines. Subtext already assigned a Player to each of your Throughlines. It placed your Main Character in the Main Character Throughline, your Influence Character in the Influence Character Throughline, and their Relationship in the Relationship Story Throughline. Subtext also created a group of "characters" that it placed within the Overall Story Throughline. For reasons we'll explain later, it's easier to think of the Players within the Overall Story Throughline as a "group" of characters, rather than anyone specific. Feel free to tap on any of the Players in the list to the left, and change their names. When you do, you'll see your changes reflected in the assigned Player Roles on the right. Subtext is constantly saving everything you do. That's why you won't find a Save button anywhere. Make your changes, see them instantly reflected throughout the application, and don't worry about losing any material. It's how it should be in 2018. Just for fun, click on the icon for the Main Character in the list of Players and drag him or her into the Overall Story Throughline. Once there, release and Subtext will add that Player to the list of available players within that Throughline. Now that we have our list of possible Players assigned to the individual Throughlines, it's time to start working those Storybeats. Tap on the Storybeats button and you'll see a list of 21 Storybeats divided up into Structural Acts. One Beat for each Throughline for each Act. 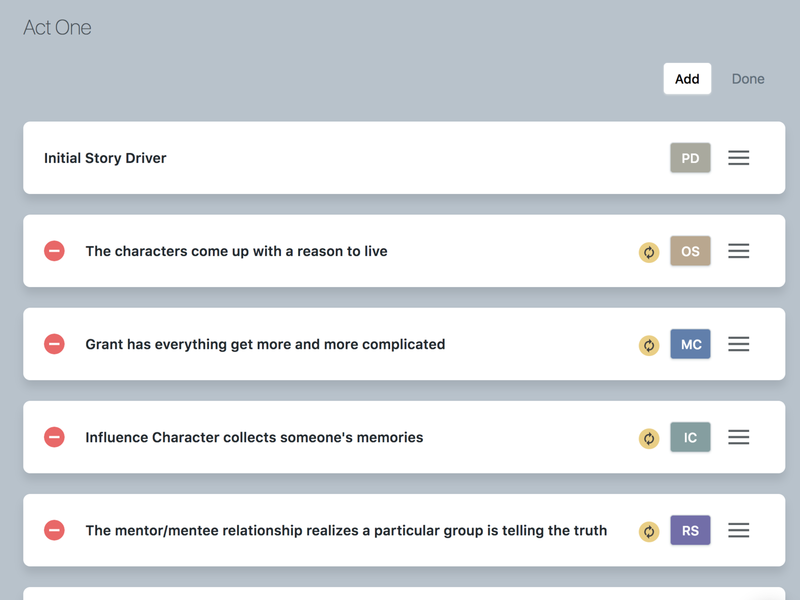 And an additional five Story Drivers (Plot Points) that frame the structure based on your chosen Narrative Argument. Subtext recognizes the difference between structural Acts and experiential Acts (Audience). When developing your Storybeats, Subtext will divide your narrative up into FOUR Structural Acts. When viewing the final Treatment, Subtext adjusts to present the typical THREE Act Structure familiar to most writers. In this way, the writer can take advantage of building a story that is structurally sound, while being able to deliver a story to an Agent or Producer that matches the common tongue of most professionals. Based on the Narratvie Argument you selected, Subtext went through each Beat and randomly assigned creative Storytelling. This Storytelling, while random in nature, adheres to the foundational aspect of the narrative, i.e., it needs to be something like this to maintain the integrity of your story. Tap on a Storybeat and you'll be presented with an opportunity to develop that Beat in greater detail. The Structure tab gives you access to the structural element associated with this particular Beat, while the Storytelling tab allows you to expand on the suggested Storytelling with ideas of your own. Return to the Structure tab and tap the drop-down associated with your Beat. Subtext searches its extensive collection for other instances of Storytelling that say the same thing, but perhaps say it in a way that better connects with your own writer's intuition. Feel free to tap on an instance of Storytelling that sounds better to you. Notice again how the Beat adjusts instantly to your selection. Return to the Storytelling tab to come up with your own Title for this Storybeat and to briefly jot down a synopsis that captures the essence of this particular Beat. Storybeats are NOT scenes. Scenes are a completely arbirtrary made-up thing that are subjective and personal to every writer. A single "scene" might contain several Storybeats--or it might just have one. Save "scenes" and "sequences" for when you're actually writing. Rifle through the various options, expand the Storytelling with your own ideas, and when you're done, tap the Beat again to close up the detail and return to the Storybeat list. Tap the Edit button in the upper right of the first Structural Act, and you'll be presented with an opportunity to change the order of Beats. While the order of Acts is super important to the message of your story, the order of Beats within each Act is entirely up to you. Tap the Re-order icon (the three horizontal lines) to drag and drop Storybeats into place, much like you would with any other application. Feel free to tap the gold Randomize button found in almost every Storybeat to have Subtext quickly find another way of imagining this event in your story. Randomizing is a great way to spark your creativity and to open up your story in an entirely new direction--all while maintaining the integrity of that original Narrative Argument. --congratulations! You now have the basis for a solid and meaningful story. The individual Throughlines sections offers writers an opportunity to focus on one of the Four Throughlines to the exclusion of all the others. Tap Overall Story or Main Character or any of the other Throughline buttons to see only the Storybeats for that particular Throughline. Once you start to develop an intuition for these Four Throughlines, start your building process here. Focus on the storyline of each Throughline, and work them in isolation. When you get them feeling like their own individual "stories", return to the Storybeat view to weave them together into one master story. Developing a complete and meaningful story is one thing--delivering it to those who sign-off and greenlight your idea is another. With Subtext, all you need to do is tap on the Treatment button to find the latter. Within the Treatment view, you'll find your Narrative divided up into the traditional Three Act Structure. In addition, if you came up with any alternate Titles for the Storybeats or developed Synopsis material within the Detail Panels for Storytelling, Subtext will include them in your Treatment. What Subtext won't include is any structural elements. Readers, producers, agents--they don't care about structure, they just want to know the story works. 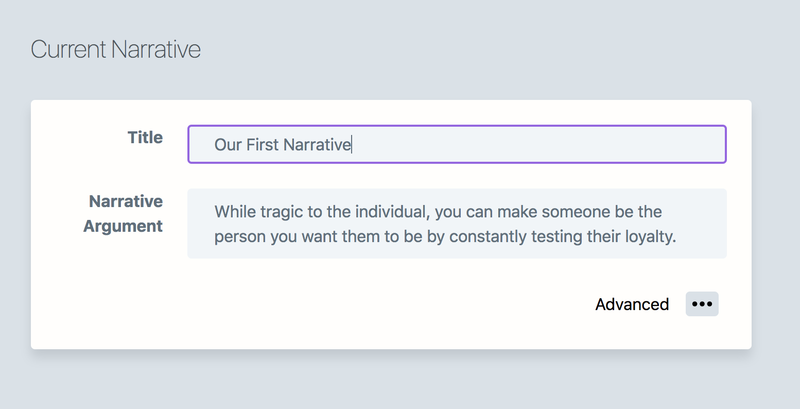 Subtext gives you that opportunity to quickly hand-off a finished Treatment to whoever is in line next in the development process by clicking the Treatment button. Along the top of your Treatment, you'll find options to download your Treatment in either the Markdown or Fountain format. If you prefer to work in Scrivener or most iOS writing apps, download the former. If you're a screenwriter and work in Highland or Slugline, download the latter. More downloadable formats are on the way. In just a few hours, you developed a strong and meaningful story with Subtext. With a structure based on intent, rather than cultural or "expected" beats, your Treatment will stand out as something carefully considered and NOT formulaic or rote in nature. In addition, and probably without you realizing it, you started to develop your own writer's intuition for how a complete story works and how to build one with confidence and purpose. After a few months, even years of this process, you'll start to develop a strong and perceptive story sense that will carry you throughout your development career. Browse our collection of Narrative Arguments, search your favorite films or novels, and find a message that speaks to you. Then get started creating a story that's important to you--one that says something--and one that will last.